The Island of Dolls is a Terrifying Nightmare! Not directly related to this island, but mysteriously associated with the events that happened here 60 years ago, the legend of La Llorona was born in Cuemanco, one of the docks from where you can embark on the gondola that will take you to the Island of the Dolls. Locals say that a woman used to live close by, along with her children. They lived happily until one day when the woman fell madly in love with a man who didn’t want any children. Mad with passion and longing, the women did something abominable – she drowned her children so that she would be free to be with the man she loved. Unfortunately, her sacrifice and despicable crime were in vain. The man rejected her. Destroyed by what she had done, the women committed suicide by drowning herself. But her crime was so heinous and unspeakable that she would not find rest. The locals will tell you that they can still hear her crying and weeping in the night, calling her children. Heartbreak seems to be the fuel that powers the strange happenings near Mexico City. In 1950, a man named Don Julián Santana, retreated to the Island of the Dolls to live the rest of his days as a hermit after the woman he loved left him for another man. But he was never alone. 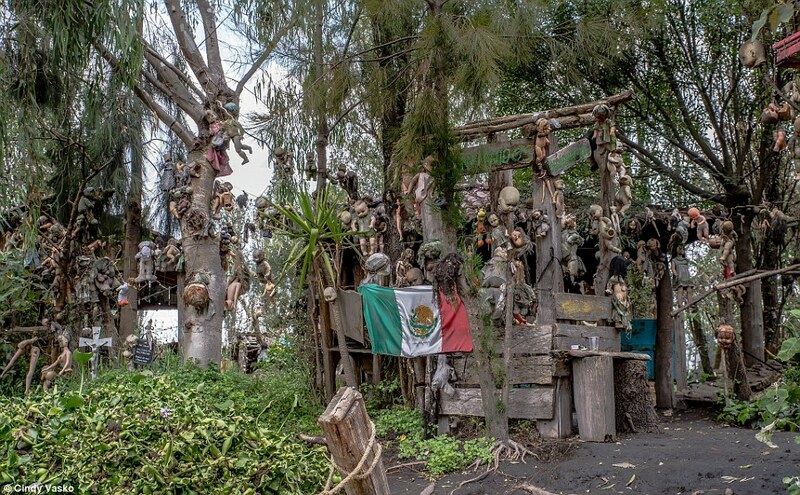 Soon after making this island his home, Don Julián discovered the body of a little girl that had drowned in the canal. After he had buried the corpse, he found a doll floating in the canal and assumed it had belonged to the little girl. He fished it out of the canal and hung it to one of the trees. But this was not the end of it – the horror was just beginning to unravel. A tribute to ghosts or the expression of regret? Don Julián began to experience strange happening after finding the little girl. He would hear children’s crying at night and whispers in the dark, reaching out to him. He became obsessed with finding more dolls which he would hang from the trees to protect himself and appease the spirits. 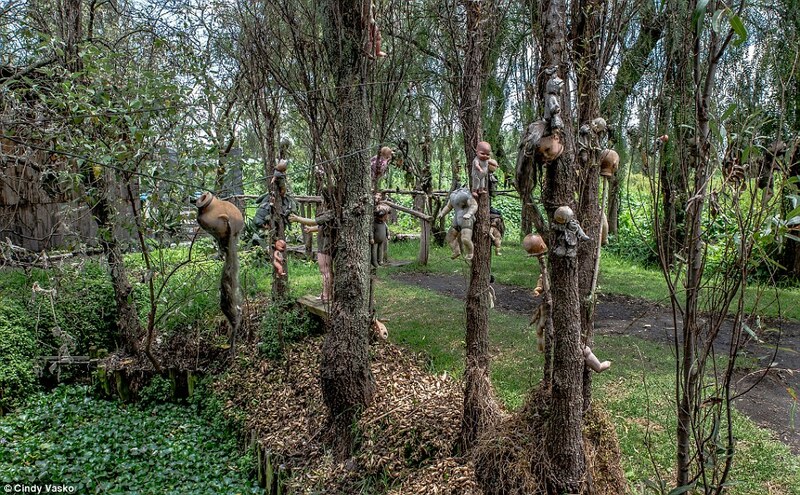 In his lifetime, it is estimated that he has collected over 1500 dismembered dolls that are now hanging from the trees of the Island of the Dolls, offering a blood-curling sight. 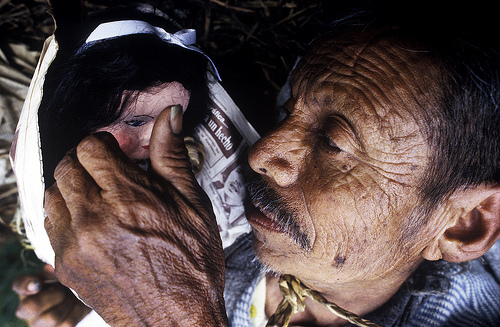 Many people believe that Don Julián was so overcome with regret at not being able to save the little girl from drowning that he thought the dolls to be real children. As a result, he was fishing them out of the river, forever re-enacting the drama he lived, but with a different end. Even though this seems plausible, locals truly believe that the island is a place that belongs to the spirits. The fact that Don Julián himself died there drowning in the same canal where he found the little girl, raises questions, even among the most skeptical. Getting to the island is rather difficult, but once you arrive, you will be greeted by a sight that seems to be taken out of a horror movie. After being two hours on a boat, you will disembark on a tiny island only to see an image that will haunt you for the rest of your life. 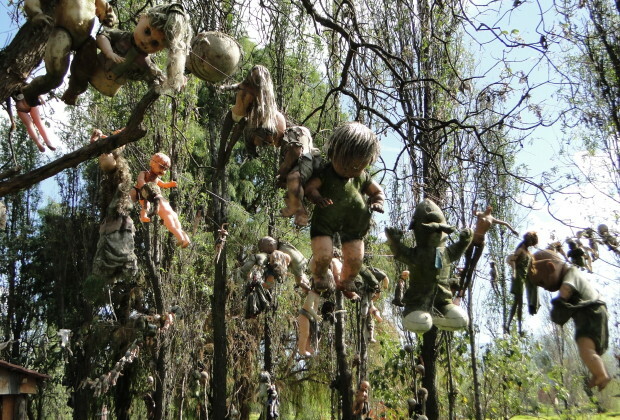 Hanging from trees of laying on the ground, thousands of disembodied dolls with dead eyes, peeled-off skin, and decaying hair will stare at you, watching your every step. Some of them have insects crawling inside them, offering a disturbing view – the kind of sight nightmares are made of. Tourists that have visited the island swear that they have heard the dolls whispering and seen their eyes move. 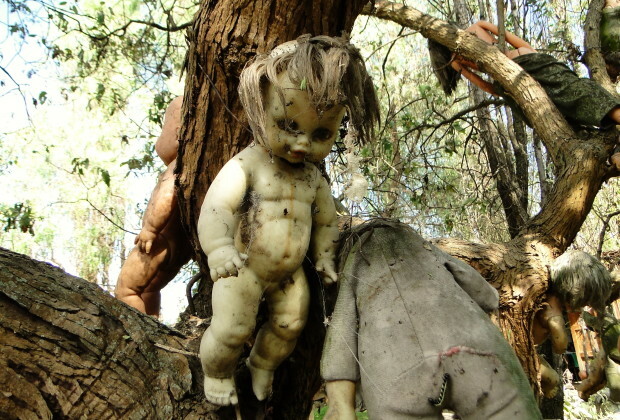 Locals believe the dolls to be possessed by the spirits of all the children that had drowned. Anastasio, Don Julián’s cousin still lives on the island and believes that, under no circumstances, should the dolls be moved from their places. He swears that the dolls come alive at night, and he considers them to be some sort of tribute to the dead. 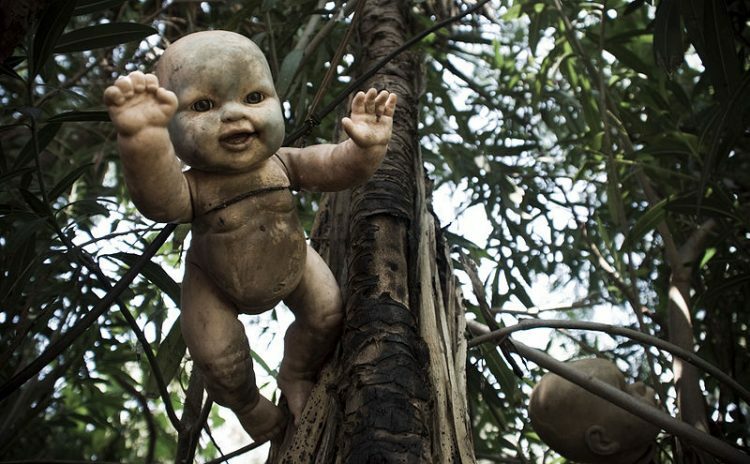 You can visit this eerie island, but, no matter what you do, don’t touch the dolls. Touching one of them is like disturbing a grave – you may not like the consequences. Being born in the land that gave birth to Prince Vlad Tepes (you may know him by the name of Dracula) shapes you. I grew up with myths, legends, and stories that many people believe to be true. And so do I as a matter of fact. That’s why I combined my two great passions – writing and seeking the extraordinary. I am an avid hunter of secrets and legends, and I travel to discover mysterious and fascinating places that inspire me to offer you more than articles – to provide you with the means to see through my eyes and experience goose bumps as you read about the unknown lurking in the shadows. Besides paranormal, mysteries and legends, I also like red wine, snowflakes, and burgers. Yep, we all need our passions, so I am still seeking for the burger-man who lives in Antarctica and has a cellar full of spicy, 100-years red wine bottles. But, in the meantime, I discover exciting places filled with mystery and reveal them to you. Enjoy! Creepy Abandoned Land of Oz Re-opens! The Terrifying Forest where People go to Die!